DoingTimeWithBernie.com: Liar, Tax Cheat, Eight-Time Convicted Felon Bernard Kerik calls out Quentin Tarantino for lying? Hypocrite Much, Bernie? Liar, Tax Cheat, Eight-Time Convicted Felon Bernard Kerik calls out Quentin Tarantino for lying? Hypocrite Much, Bernie? Yes, this happened. On twitter, all-time liar on fire, Bernard Kerik, called out Quentin Tarantino for lying! 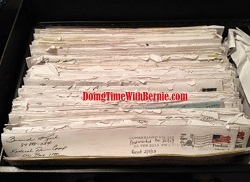 Well, in the personal experience of www.DoingTimeWithBernie.com, if anyone knows about lies and deceit, it's definitely Bernie Kerik! IOHO Bernard Kerik has made an entire life and career by lying!